Last Saturday night I went to bed at 9:30 pm and woke up promptly at 12:30 am. After staying in bed for 30 minutes trying to go back to sleep, I realized my only option was to get up and go do something without waking up the rest of the household. Toby, the dog, looked up as I walked into the family room as if to say: Not again! Yes, again I can't sleep. The two latest books I received from Martingale for review were standing guard at the coffee table, and I needed no further enticement! There is an amazing collection of rectangular blocks in The 4" x 5" Quilt-Block Anthology - 182 blocks for Reproduction Fabrics by Carol Hopkins and Linda M. Koenig. I have been making square quilt blocks forever and was delighted by the unexpected variety, beauty, and creativity revealed on each page! 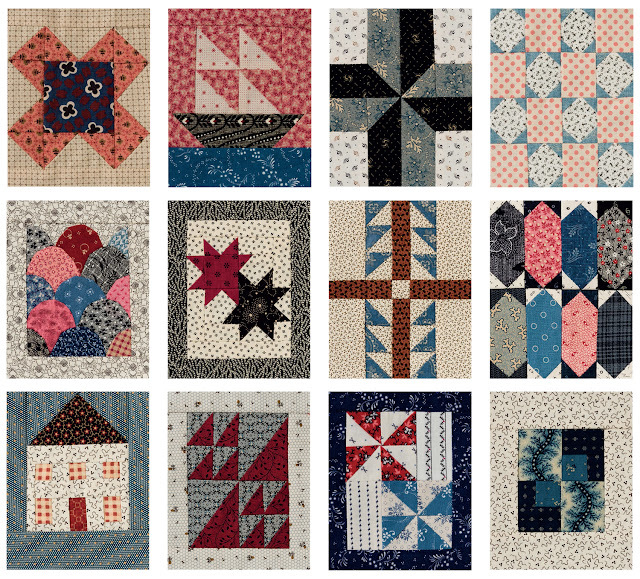 What began as a block exchange with Carol, Linda, and three other friends with the purpose of creating 4"x 5" rectangular blocks using reproduction fabrics in blue, black, red, and double pink, culminated into a selection of 182 unique blocks ready to be featured into a sampler quilt, or used on their own in a repeat pattern. What great blocks, I thought! Some I recognized and others were so new and unique. 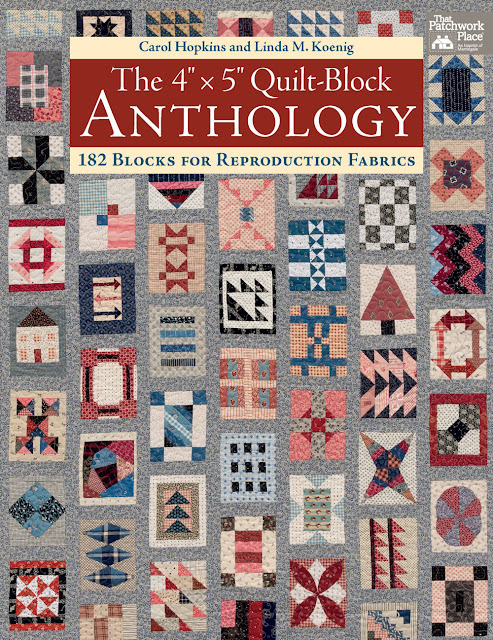 Each page has a photograph of the block, diagrams, and easy-to-follow instructions. About 20 minutes into the book I took it to my studio and started going through my small stash of reproduction fabrics (I need to remedy this situation!) in search of the perfect fabrics. I decided to make a small sampler quilt, a project I could start and finish before my family woke up on Sunday morning. Using fabrics from a Churn Dash quilt I made and hand quilted a few years ago, I made four blocks, prepared the quilt sandwich, and stared at it wondering how I would quilt it. 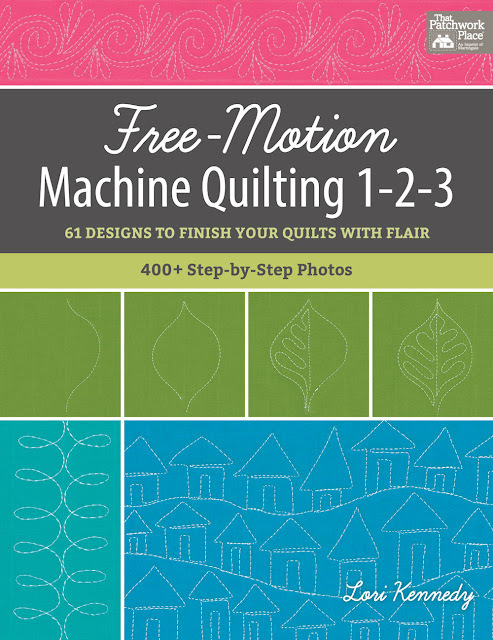 It was then I remembered the second book on my coffee table, Free-Motion Machine Quilting 1-2-3: 61 Designs to Finish Your Quilts with Flair, by Lori Kennedy. Maybe I could find the perfect motif in it! Look at these! The motifs in this book are divided into 8 categories (loops, pictorial, flowers, etc. ), each one accompanied by step-by-step photographs to help you create amazing texture on your projects. 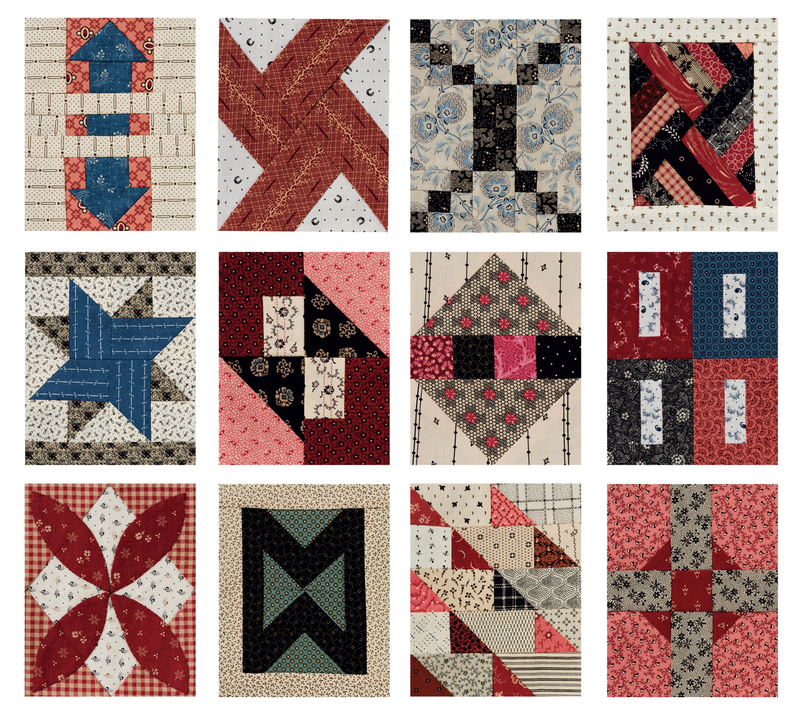 I do love single-line designs for free-motion quilting, but never attempted designs such as houses, umbrellas, and pencils before. Yes! As I searched for an idea, I read through the Supplies and Setup section. 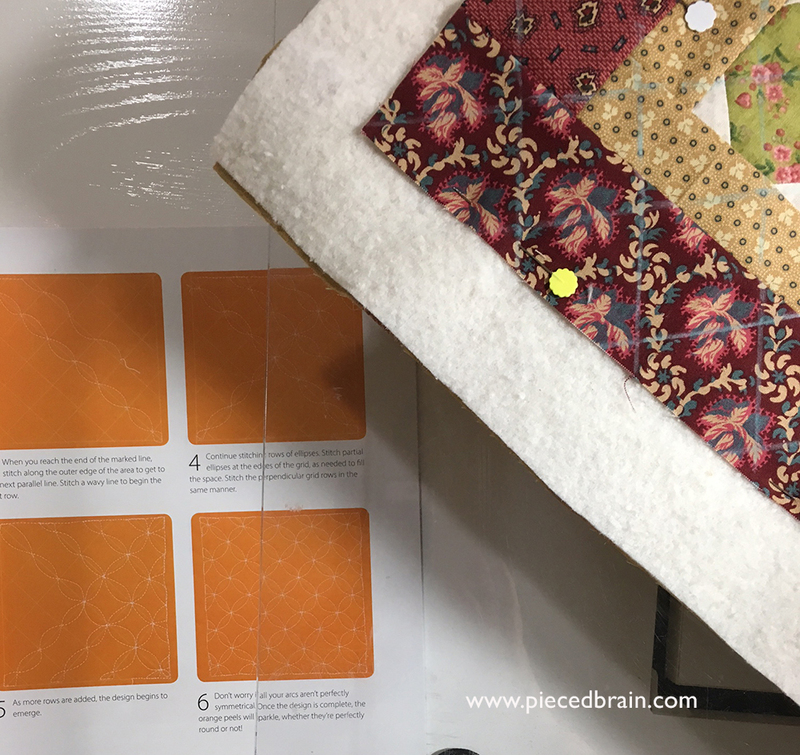 Although I am no stranger to free-motion quilting, Lori's 12-Step Setup check list is a perfect reminder of things we need to do as we get ready to quilt. The section on marking tools and threads (two anxiety-building items for many beginners) was comprehensive and to-the-point. I looked through the pages and thought "Yes, I can do this". But still, I needed a more traditional motif to complement the reproduction sampler I had made. That is when I found the Orange Peel instructions on page 138. I had only quilted orange peels inside a block before in this quilt. 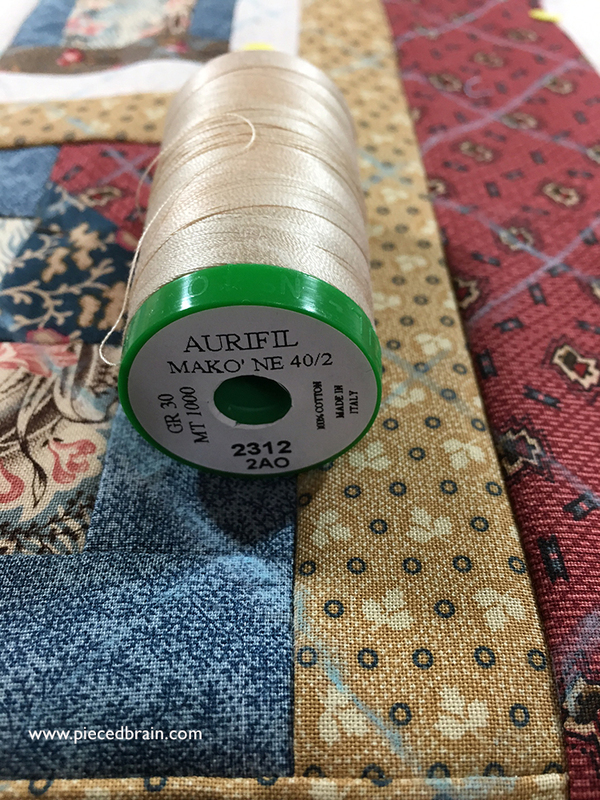 I marked the quilt, chose the perfect thread - Aurifil 40 wt - and ventured into making curved lines. 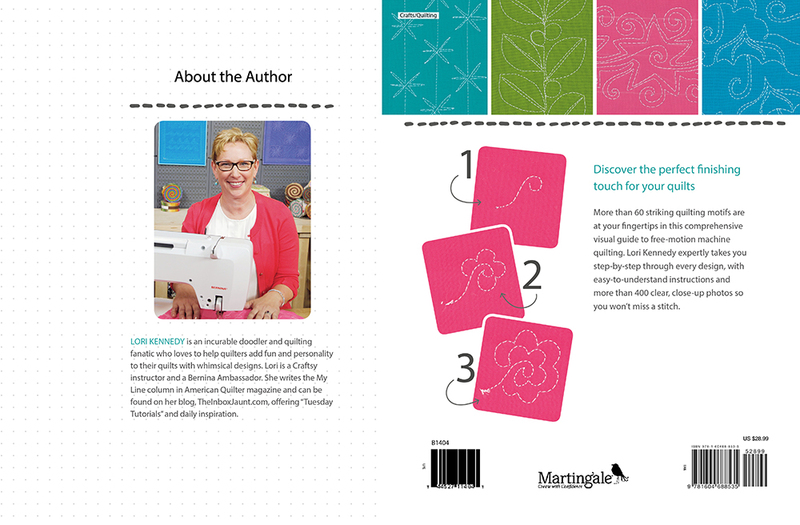 This book has spiral binding: I kept it open on the page I needed next to my sewing machine as I could easily refer to it when I did not know where to go next. Sweet! 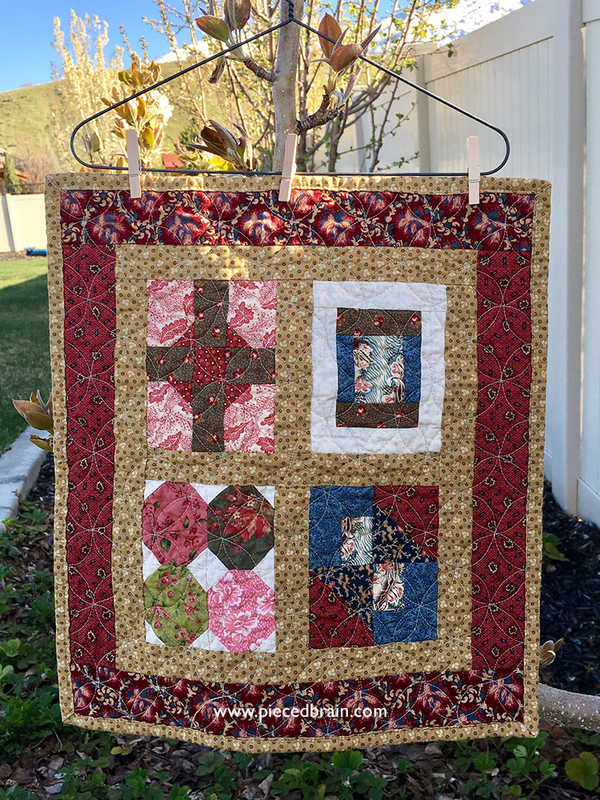 I bound it by machine and as soon as the household was alive I threw it in the washing machine because I wanted to give it a worn look. I usually do not wash wall hangings but this time I could not resist. Never mind that it has taken me a few days to recover from that all-nighter. Oh, but was it ever worth it. 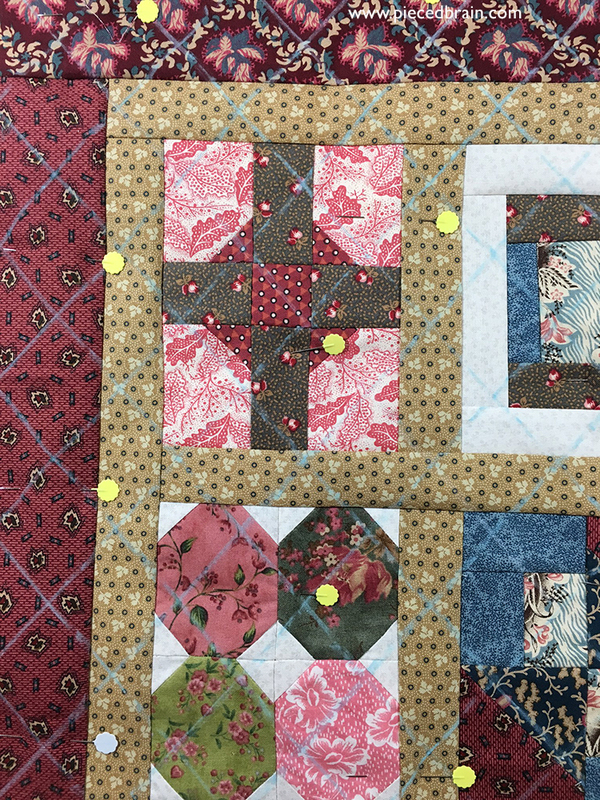 Of course, I am now looking at those rectangular blocks, thinking of the other fabrics I have, and wondering what combination of blocks would make a perfect canvas for the umbrella quilting motif. Or the row of houses. Or the square flower. Books. They provide endless inspiration, feed my passions, and allow me hours of comfort and relaxation, all the while helping me develop my skills. Combine them with fabrics - reproduction, modern, 1930s, any fabric really, and adorn them with straight lines or curved ones, and there you have it: a sleepless but happy girl. Do you see the flowers on my peach tree? 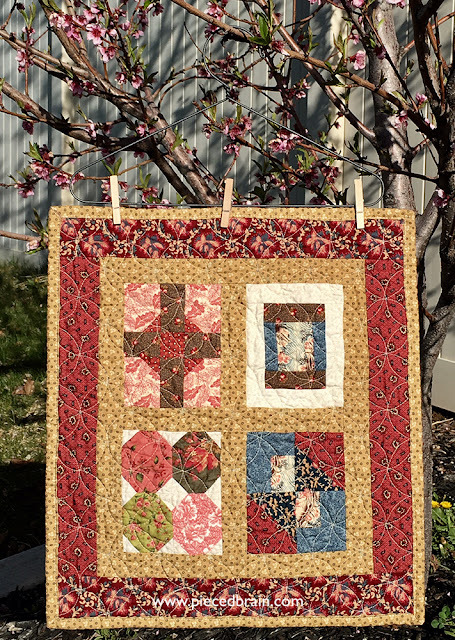 I had not seen them until I went outside to photograph this yet unamed sampler. Looking forward to delicious fruit in the summer. 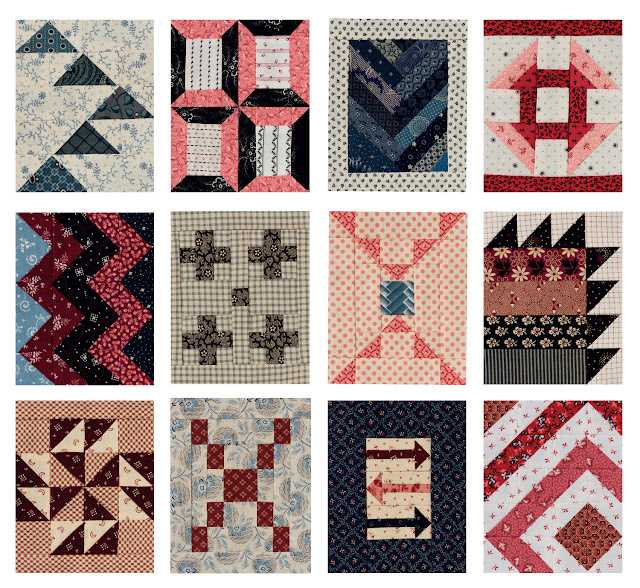 In the meantime, would you help me name this quilt? What an awesome little quilt. I'm not sure of a name for it! I have been wanting the Anthology book. What cool blocks and beautiful colors. 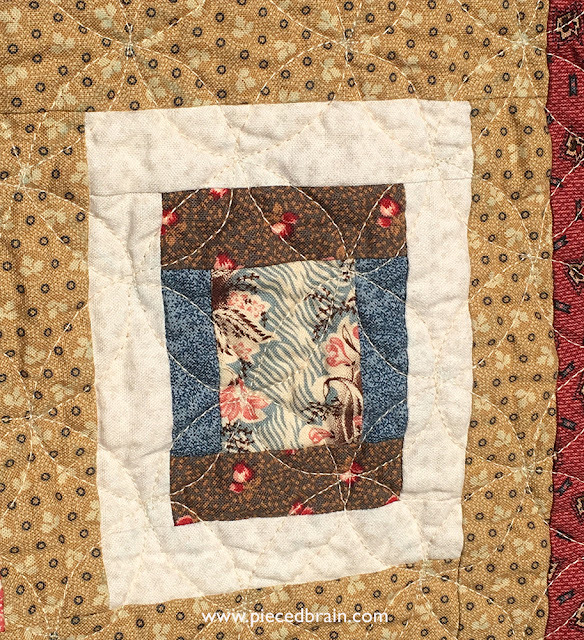 It's cool that the quilt had you recognize the flowers. Pretty blooms!! Happy Easter!!!! No idea about the name. I see Easter eggs and cross :D Interesting sampler. Just a thought! Peach Blossoms or Easter Revisited or Anthology Spring. I think Sleepless in...(your town) or Sleepless in Cyberspace, as that's where I read about it. Wide awake. Good Morning Beautiful. Some play on words that references the insomnia.